The iconic Everglades is the largest sub-tropical wilderness in the continental United States, once reaching all the way from the Orlando area in Central Florida to Florida Bay. It was an enormous wilderness of wetlands containing sawgrass marshes, freshwater sloughs, mangrove swamps, pine rocklands and hardwood hammocks. The Native Americans who lived there named it Pa-hay-Okee, which means "grassy waters." The word Everglades comes from the word "forever" and "glades," an old English word meaning "a grassy, open place." In 1947, the government set aside 1.5 million acres, a small fraction of the Everglades, for protection as Everglades National Park. Ranger-Led Programs: Each of the four visitor centers offers ranger-led programs that range from guided tours to talks about specific animal species. 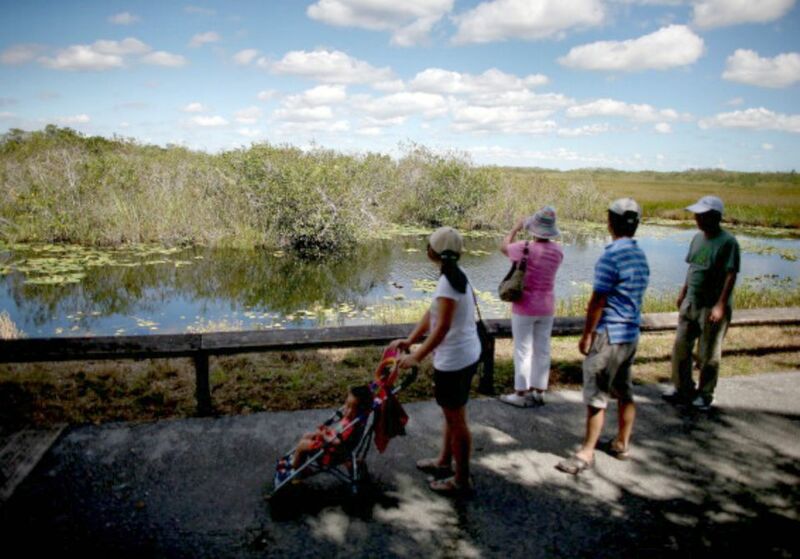 Shark Valley Tram Tour: This excellent two-hour narrated tram tour leaves multiple times every day and completes a 15-mile loop where you may see alligators and many species of animals and birds. Airboat Rides: Since the majority of Everglades National Park is managed as a wilderness area, airboats are prohibited within the majority of its boundaries. The exception is a newer section in the northern area that was added as park land in 1989. Private airboat operators are allowed to offer tours in this area. They are located off of U S 41/Tamiami Trail between Naples and Miami.